Anyway, back to Martha: one of the first cakes I saw on her blog (back in 200... – who knows?) 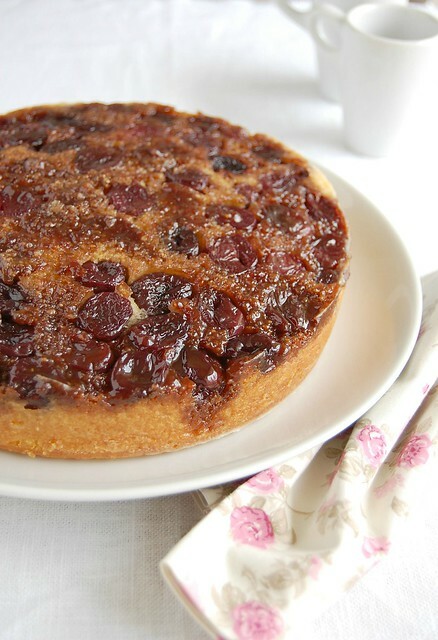 was her cranberry upside down cake – isn’t it gorgeous? Since fresh cranberries do not exist here in Brazil I decided to mimic Martha’s cake using fresh cherries instead; I ended up with such a tasty cake – so tender! – that I regretted not doing that years ago. Preheat the oven to 180°C/350°F. Butter a 20cm (8in) round cake pan and dust with flour. Make the fruit topping: combine the butter and brown sugar in a medium saucepan and heat over medium heat until the butter is melted. Stir in the cherries, increase the heat to medium-high and bring just to a boil. Cook for 3-5 minutes or until cherries begin to become tender. Use a slotted spoon to transfer the cherries to plate to cool. Set aside the caramel still in the saucepan. Arrange the cherries in the bottom of the prepared pan. Bring the caramel back to a boil over medium-high heat, cook without stirring for 2 minutes then pour over the cherries (caramel will be thicker). Make the batter: combine the flour, baking powder, cornmeal, almond meal, and salt in a medium bowl. Set aside. In the large bowl of an electric mixer beat butter and sugar until light and fluffy, about 3 minutes. Scrape the sides of the bowl occasionally. In low speed, add the eggs, one at a time, beating well after each addition. After incorporating the eggs, turn the mixer to high speed and beat until mixture is light and increased in volume, about 2 minutes. Beat in the vanilla extract. With the mixer in low speed, add the dry ingredients in three additions alternating with the milk, beginning and ending with the dry ingredients. Scrape the sides of the bowl then beat the batter in high speed for 30 seconds. Pour the batter gently over the cherries and smooth the surface. Bake until the cake is golden and a toothpick inserted in the center of the cake comes out clean, 40-45 minutes. Transfer the cake to a wire rack and cool it in the pan for 10 minutes. Carefully unmold the cake onto a serving plate. Serve warm or at room temperature. Cake can be stored in an airtight container at room temperature for up to 2 days. Seriously cant take my eyes from ur irresistible click,super gorgeous cake. Patricia, it looks delicious, sweet-sour, tender, moist... Must try it myself! And good luck on the sewing search. This is so mouthwatering!! I haven't tried it yet but I have just bookmarked this post and will cook it tonight! What a gorgeous cake - I'd like to have a slice for breakfast with my coffee! I bet the sweet/saltiness of the cornmeal pairs perfectly with the cherries. Sounds amazing! What an incredible dessert. It looks sensational. We don't have cranberries either...I think I have this recipe in one of my books of hers. With the cherries it sounds fantastic! Oh wow! This looks great!! I love cherry's and this cake looks amazing!! We've made this cake many times, with great success. I'll have to try your cherry version. It looks lovely. This is a very beautiful and delicious looking cake!